I am a newbie when it comes to traveling with pets. The recent addition of a sweet adopted puppy named Oliver Twist has added a new challenge to our travel planning; searching for a hotel chain that is both pet-friendly and kid-friendly seems like a daunting task. 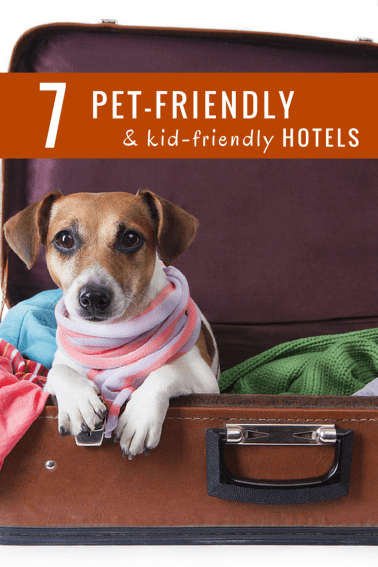 To help other parents searching for the sweet spot where pets, families, and hotels combine, Trekaroo has compiled this fantastic list of great hotel chains for pet-friendly travel in North America and beyond. All pets are welcome –at no extra charge– no matter their weight, size, or breed. 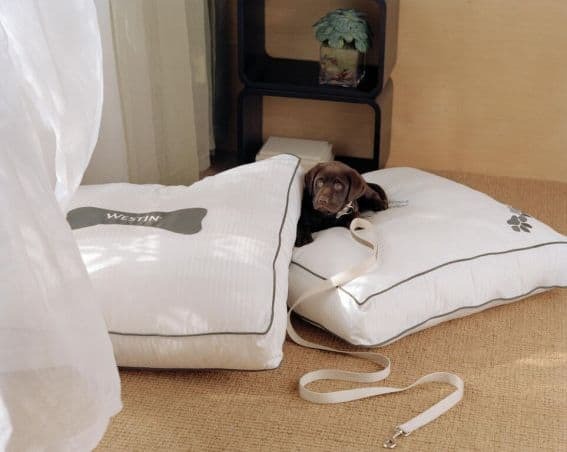 Hotels are stocked with pet-friendly amenities and perks including plush pet-beds, food, water bowls, and mats. Concierge staff offers lists of nearby pet-friendly restaurants, parks, and groomers. Pet sitting, walking, massage, and acupuncture can often be arranged. Many locations boast a Director of Pet Relations, an honorary canine in charge of greeting and interacting with guests. Expert Kimpton picks include the Canary Hotel in pet-friendly Santa Barbara, and 70 Park Ave in New York City. Read kid-friendly reviews of a Kimpton Hotel near you. Read Kimpton’s Life is Suite-Pet Love Blog for tips & travel inspiration. Custom pet beds, floor mats, food bowls, ID tags, and many more pamper your pet’s stay. Welcome kits, received at check-in, offer tips on nearby exercise opportunities for your dog’s stay. Individual hotel policies vary and might require an extra per night charge or deposit. Dogs larger than 40 pounds are allowed at management’s discretion. The Westin La Paloma Resort & Spa in Tuscon offers a divine package for pets. The VIP treatment includes a Westin Heavenly Dog Bed, treats, toys, and everything you need for an easy pet-friendly stay. To determine pet policy for each location, visit the Westin Customer Assistance Center. Up to two domestic dogs (up to 80 lbs each) are allowed in each pet-friendly room. Other pets like cats, birds, monkeys, and snakes are allowed on a case by case basis with prior approval from individual properties. A refundable damage deposit of up to $50/stay may be required for pets. The maximum charge per day for pets is $20/room. Celebrity Pet Travel Expert Cesar Milan loves Best Western Hotels and pets. Check out his Pet Travel Tips with Cesar Milan. Explore Best Western’s Travel With Pets Program for more information. Fairmont Hotels & Resorts, the family-friendly luxury brand located across the globe, is also a great hotel chain to bring your pet to. Although hotel policies differ based on location (as some geographical areas restrict pets in hotels), the general attitude towards pets at the Fairmont is extremely favorable. Pets are welcome in all North American locations, although weight restrictions do apply. Cleaning fees vary, but ensure that each guest receives a clean and allergen-free room upon check in. Some locations, such as the Fairmont Washington, D.C., Georgetown, offer the VID- Very Important Dog program that offers handmade treats, water, and concierge services at check in. 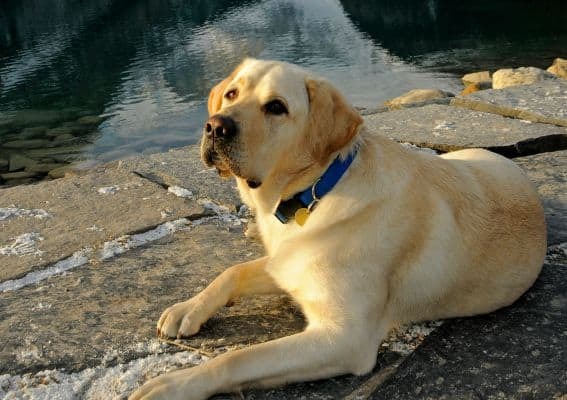 The Canine Ambassador program allows guests missing their pets at home to spend time with a lovable pet while traveling. Discover the Fairmont’s pet policy for your destination. Only domestic pets (such as dogs and cats) are allowed to stay. A pet policy agreement must be signed at check in. Unlike many chains, well-behaved pets are allowed to stay alone in rooms per policy. Read the full pet-policy at La Quinta Inn & Suites. Pets receive a welcome packet at check in with dog or cat specific items including a pet toy, treat, W Hotels pet tag, clean up bag, and details about services available through the Concierge. 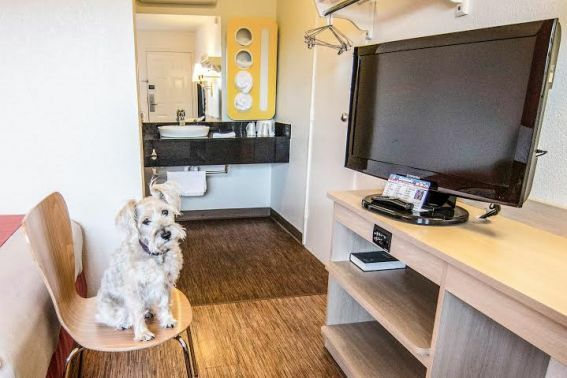 Pet-friendly rooms boast a custom W Hotels pet bed, food and water bowl with floor mat, and pet-in-room door sign, plus a special treat at turndown. W Hotels of New York (all four locations) have collaborated with Fetch Club to offer 60 minute walking passes, “canine cocktails,” grooming, pet sitting, and birthday celebrations for your pet travel companions. 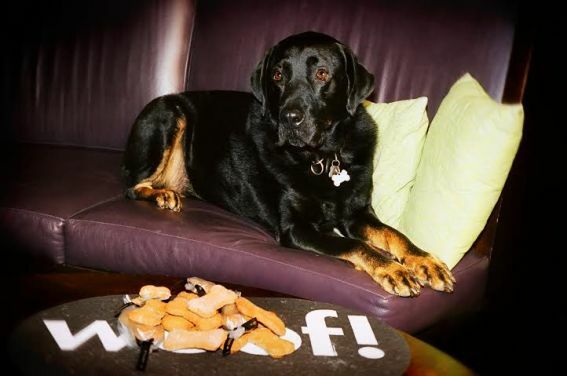 Read more about W Hotels pet policies. Pets can stay at all properties unless prohibited by local law (limit 2 pets per room). Service animals are welcome at no charge. Pet fees can be assessed per day and range from $10-$50/day maximum. 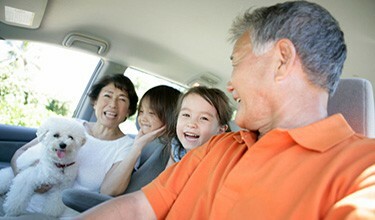 For all of Motel 6’s pet policies, explore the pet policy on motel6.com. This is so helpful. Now I know where we can stay when we travel with our dog!